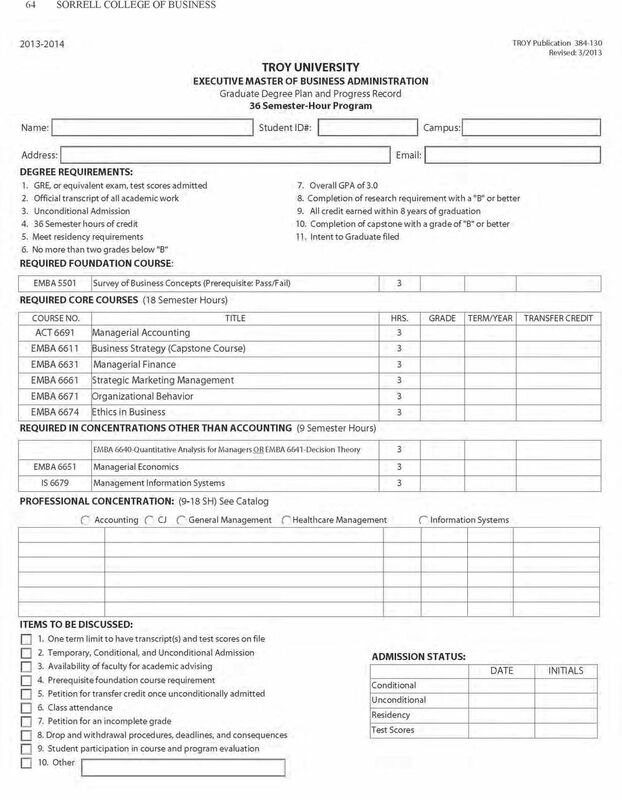 Download "SORRELL COLLEGE OF BUSINESS"
3 47 level, and content to Troy University courses and must be approved by the appropriate Troy University dean/department chair. No more than two courses (six semester hours) may be transferred in from a completed master s degree program. Degree Requirements Successful completion of the courses listed below with an overall grade point average of 3.0 is necessary to fulfill requirements for the degree. If the student makes a "D" or "F" in a core course, the course must be retaken. If the student earns a "D" or "F" in an elective course, the course may be retaken, or another elective taken in its place. All grades, including those for courses that are retaken, are calculated in the GPA required to fulfill the requirements for the degree. The student can satisfy the research component for the Master of Accountancy by receiving a B or better in ACT 6652, Financial Accounting Research. Curriculum 30 Semester Hours The curriculum for the Master of Accountancy program consists of 30 semester hours. Of these 30 semester hours, 21 hours consist of required courses and nine hours consist of electives chosen in consultation with the student s adviser. Below is a list of the required courses and the electives. Required Courses (21 Semester Hours) ACT Accounting Systems and Control ACT Financial Accounting Research ACT Advanced Financial Reporting & Analysis ACT Advanced Auditing and Assurance Services ACT Professional Certification TAX Federal Tax Research LAW Legal Issues for Accountants Electives (9 Semester Hours) Select three courses from the following: ACT Forensic Accounting & Fraud Examination ACT Advanced Management Accounting TAX Taxation of Individuals TAX Estate and Gift Taxation TAX Taxation of Corporations and Shareholders TAX Taxation of Partnerships and Partners Other courses as approved by advisor Note: Master of Accountancy Students may take no more than four classes online. There are no cross-listings with other Troy University graduate degree programs for the program. All transfer credits must be processed through normal academic approval procedures. All authorizations for M.Acc students to be a transient student at another institution must be approved before the course is attempted. Professional military education courses are not accepted for credit in the M.Acc program. MASTER OF BUSINESS ADMINISTRATION (MBA) The purpose of the Master of Business Administration program is to offer students an opportunity to acquire proficiency in general business management and decision-making skills that will enable them to carry out managerial responsibilities in both the private and public sectors. As a result of successfully completing the MBA program, graduates should to apply strong problemsolving skills to the strategic planning process in organizations. After completing the MBA business core courses students are allowed to select elective courses that align with their professional objectives and goals. Accreditation The Troy University MBA degree is accredited by the Accreditation Council for Business Schools and Programs (ACBSP). 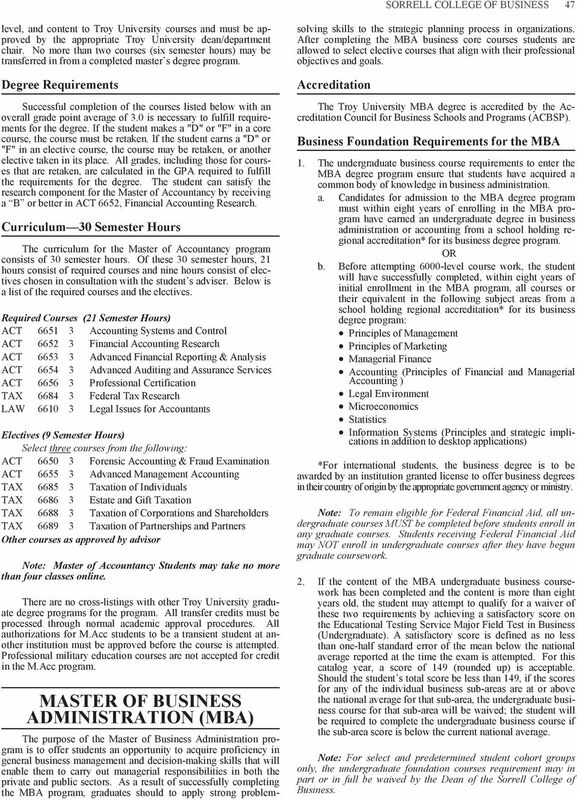 Business Foundation Requirements for the MBA 1. The undergraduate business course requirements to enter the MBA degree program ensure that students have acquired a common body of knowledge in business administration. a. Candidates for admission to the MBA degree program must within eight years of enrolling in the MBA program have earned an undergraduate degree in business administration or accounting from a school holding regional accreditation* for its business degree program. OR b. Before attempting 6000-level course work, the student will have successfully completed, within eight years of initial enrollment in the MBA program, all courses or their equivalent in the following subject areas from a school holding regional accreditation* for its business degree program: Principles of Management Principles of Marketing Managerial Finance Accounting (Principles of Financial and Managerial Accounting ) Legal Environment Microeconomics Statistics Information Systems (Principles and strategic implications in addition to desktop applications) *For international students, the business degree is to be awarded by an institution granted license to offer business degrees in their country of origin by the appropriate government agency or ministry. Note: To remain eligible for Federal Financial Aid, all undergraduate courses MUST be completed before students enroll in any graduate courses. Students receiving Federal Financial Aid may NOT enroll in undergraduate courses after they have begun graduate coursework. 2. 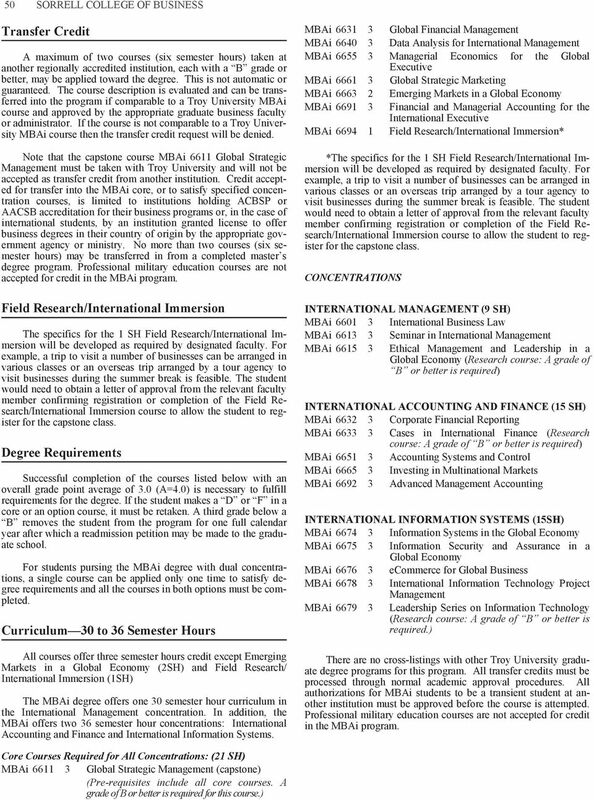 If the content of the MBA undergraduate business coursework has been completed and the content is more than eight years old, the student may attempt to qualify for a waiver of these two requirements by achieving a satisfactory score on the Educational Testing Service Major Field Test in Business (Undergraduate). A satisfactory score is defined as no less than one-half standard error of the mean below the national average reported at the time the exam is attempted. For this catalog year, a score of 149 (rounded up) is acceptable. Should the student s total score be less than 149, if the scores for any of the individual business sub-areas are at or above the national average for that sub-area, the undergraduate business course for that sub-area will be waived; the student will be required to complete the undergraduate business course if the sub-area score is below the current national average. 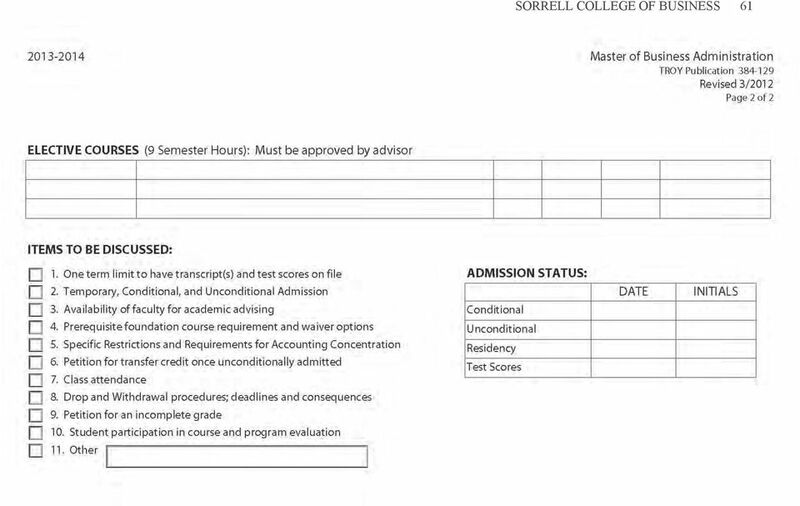 Note: For select and predetermined student cohort groups only, the undergraduate foundation courses requirement may in part or in full be waived by the Dean of the Sorrell College of Business. 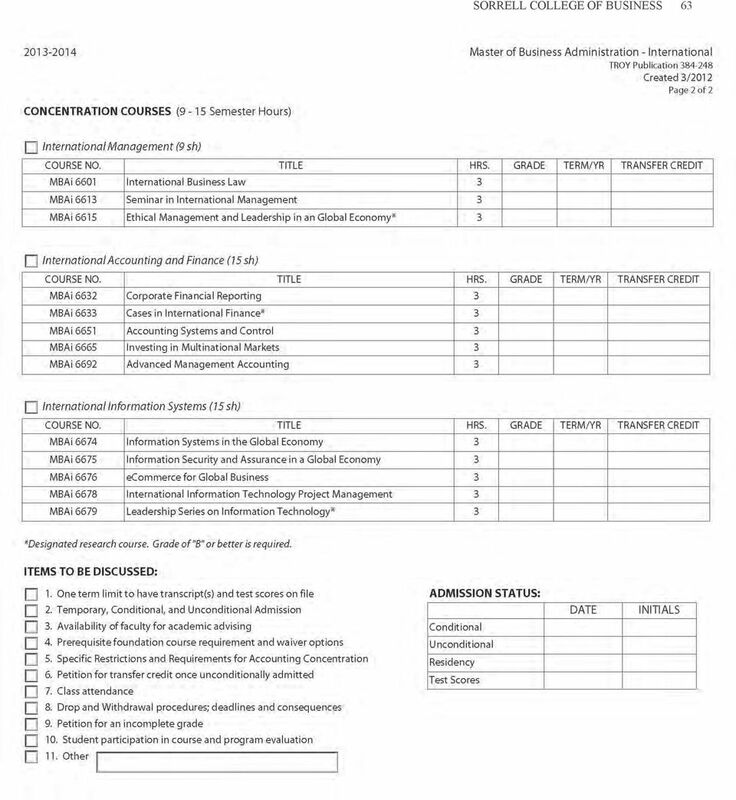 4 48 Admission Requirements for the Master of Business Administration Unconditional Admission 1. Students applying for admission must provide official transcripts from all universities attended. 2. Applicants who have completed a master s or higher degree from a regionally accredited university may be admitted unconditionally. (No graduate admission test scores are required.) Official transcripts from all universities attended must be submitted, to include an official transcript showing completion of a master s or higher degree. 3. A bachelor s degree from a regionally accredited college or university is required. (Students with a baccalaureate degree from an unaccredited or otherwise accredited institution should see Unaccredited or Otherwise Accredited Student Admissions). 4. Applicants must have achieved at least a 2.5 GPA in all undergraduate work or at least a 3.0 GPA in the last 30 semester hours. 5. 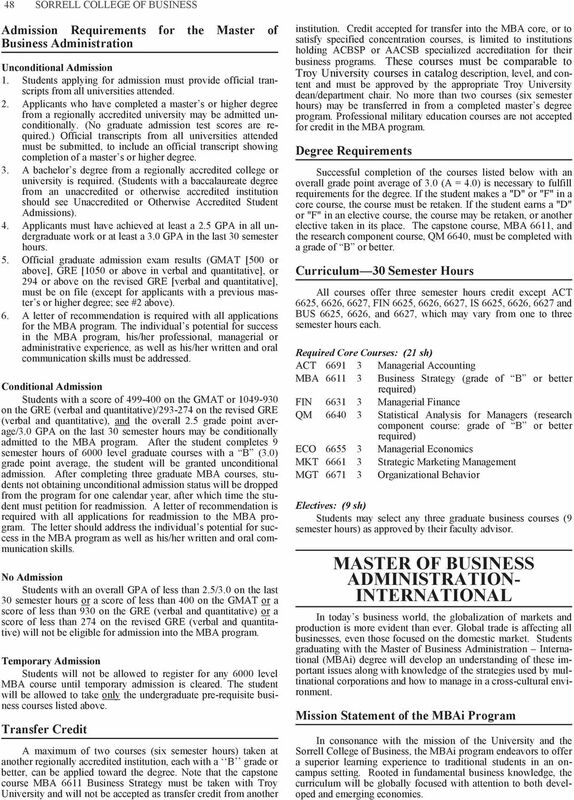 Official graduate admission exam results (GMAT [500 or above], GRE [1050 or above in verbal and quantitative], or 294 or above on the revised GRE [verbal and quantitative], must be on file (except for applicants with a previous master s or higher degree; see #2 above). 6. A letter of recommendation is required with all applications for the MBA program. The individual s potential for success in the MBA program, his/her professional, managerial or administrative experience, as well as his/her written and oral communication skills must be addressed. Conditional Admission Students with a score of on the GMAT or on the GRE (verbal and quantitative)/ on the revised GRE (verbal and quantitative), and the overall 2.5 grade point average/3.0 GPA on the last 30 semester hours may be conditionally admitted to the MBA program. After the student completes 9 semester hours of 6000 level graduate courses with a B (3.0) grade point average, the student will be granted unconditional admission. After completing three graduate MBA courses, students not obtaining unconditional admission status will be dropped from the program for one calendar year, after which time the student must petition for readmission. A letter of recommendation is required with all applications for readmission to the MBA program. The letter should address the individual s potential for success in the MBA program as well as his/her written and oral communication skills. No Admission Students with an overall GPA of less than 2.5/3.0 on the last 30 semester hours or a score of less than 400 on the GMAT or a score of less than 930 on the GRE (verbal and quantitative) or a score of less than 274 on the revised GRE (verbal and quantitative) will not be eligible for admission into the MBA program. Temporary Admission Students will not be allowed to register for any 6000 level MBA course until temporary admission is cleared. The student will be allowed to take only the undergraduate pre-requisite business courses listed above. Transfer Credit A maximum of two courses (six semester hours) taken at another regionally accredited institution, each with a B grade or better, can be applied toward the degree. Note that the capstone course MBA 6611 Business Strategy must be taken with Troy University and will not be accepted as transfer credit from another institution. Credit accepted for transfer into the MBA core, or to satisfy specified concentration courses, is limited to institutions holding ACBSP or AACSB specialized accreditation for their business programs. These courses must be comparable to Troy University courses in catalog description, level, and content and must be approved by the appropriate Troy University dean/department chair. No more than two courses (six semester hours) may be transferred in from a completed master s degree program. Professional military education courses are not accepted for credit in the MBA program. Degree Requirements Successful completion of the courses listed below with an overall grade point average of 3.0 (A = 4.0) is necessary to fulfill requirements for the degree. If the student makes a "D" or "F" in a core course, the course must be retaken. If the student earns a "D" or "F" in an elective course, the course may be retaken, or another elective taken in its place. The capstone course, MBA 6611, and the research component course, QM 6640, must be completed with a grade of B or better. Curriculum 30 Semester Hours All courses offer three semester hours credit except ACT 6625, 6626, 6627, FIN 6625, 6626, 6627, IS 6625, 6626, 6627 and BUS 6625, 6626, and 6627, which may vary from one to three semester hours each. 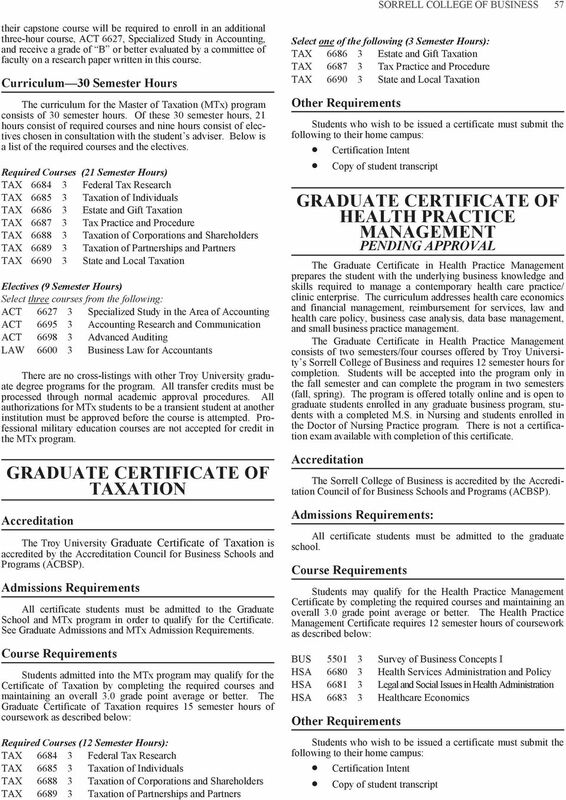 Required Core Courses: (21 sh) ACT Managerial Accounting MBA Business Strategy (grade of B or better required) FIN Managerial Finance QM Statistical Analysis for Managers (research component course: grade of B or better required) ECO Managerial Economics MKT Strategic Marketing Management MGT Organizational Behavior Electives: (9 sh) Students may select any three graduate business courses (9 semester hours) as approved by their faculty advisor. MASTER OF BUSINESS ADMINISTRATION- INTERNATIONAL In today s business world, the globalization of markets and production is more evident than ever. Global trade is affecting all businesses, even those focused on the domestic market. Students graduating with the Master of Business Administration International (MBAi) degree will develop an understanding of these important issues along with knowledge of the strategies used by multinational corporations and how to manage in a cross-cultural environment. Mission Statement of the MBAi Program In consonance with the mission of the University and the Sorrell College of Business, the MBAi program endeavors to offer a superior learning experience to traditional students in an oncampus setting. Rooted in fundamental business knowledge, the curriculum will be globally focused with attention to both developed and emerging economies. 5 49 Accreditation The Troy University MBAi degree is accredited by the Accreditation Council for Business Schools and Programs (ACBSP). 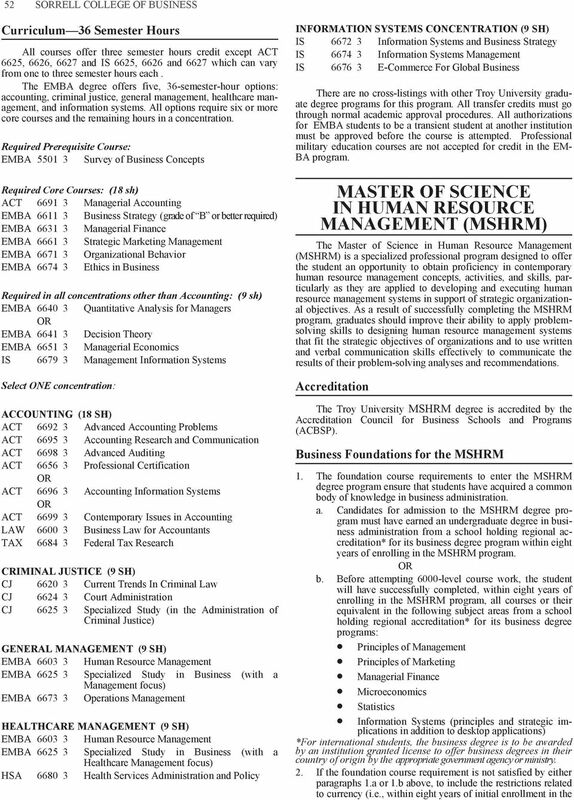 Business Foundation Requirements for the MBAi 1. The undergraduate business course requirements to enter the MBAi degree program ensure that students have acquired a common body of knowledge in business administration. a. Candidates for admission to the MBAi degree program must within eight years of enrolling in the MBAi program have earned an undergraduate degree in business administration or accounting from a school holding regional accreditation* for its business degree programs. OR b. Before attempting 6000-level course work, the student will have successfully completed, within eight years of initial enrollment in the MBAi program, all courses or their equivalent in the following subject areas from a school holding regional accreditation* for its business degree programs: Principles of Management Principles of Marketing Managerial Finance Accounting (Principles of Financial and Managerial Accounting ) Legal Environment Microeconomics Statistics Information Systems (Principles and strategic implications in addition to desktop applications) *For international students, the business degree is to be awarded by an institution granted license to offer business degrees in their country of origin by the appropriate government agency or ministry. Note: To remain eligible for Federal Financial Aid, all undergraduate courses MUST be completed before students enroll in any graduate courses. Students receiving Federal Financial Aid may NOT enroll in undergraduate courses after they have begun graduate coursework. 2. 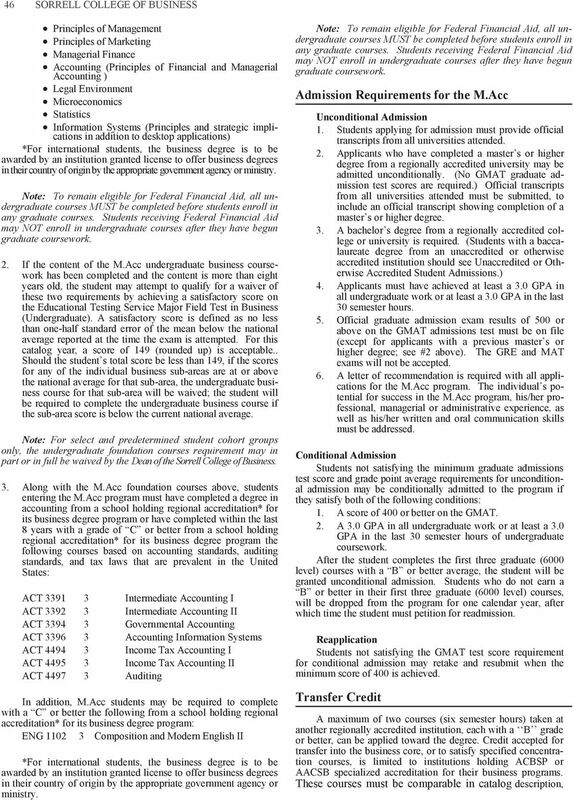 If the content of the MBAi undergraduate business coursework has been completed and the content is more than eight years old, the student may attempt to qualify for a waiver of these two requirements by achieving a satisfactory score on the Educational Testing Service Major Field Test in Business (Undergraduate). A satisfactory score is defined as no less than one-half standard error of the mean below the national average reported at the time the exam is attempted. For this catalog year, a score of 149 (rounded up) is acceptable. Should the student s total score be less than 149, if the scores for any of the individual business sub-areas are at or above the national average for that sub-area, the undergraduate business course for that sub-area will be waived; the student will be required to complete the undergraduate business course if the sub-area score is below the current national average. 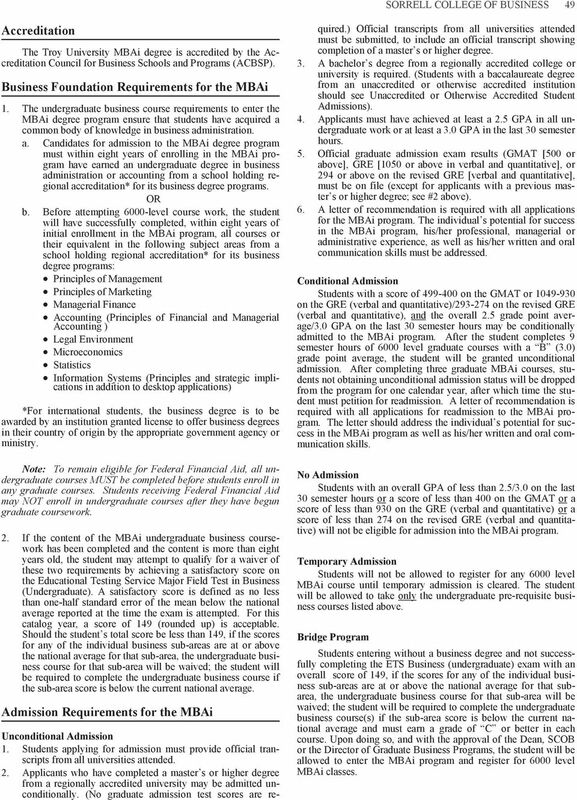 Admission Requirements for the MBAi Unconditional Admission 1. Students applying for admission must provide official transcripts from all universities attended. 2. Applicants who have completed a master s or higher degree from a regionally accredited university may be admitted unconditionally. (No graduate admission test scores are required.) Official transcripts from all universities attended must be submitted, to include an official transcript showing completion of a master s or higher degree. 3. A bachelor s degree from a regionally accredited college or university is required. (Students with a baccalaureate degree from an unaccredited or otherwise accredited institution should see Unaccredited or Otherwise Accredited Student Admissions). 4. Applicants must have achieved at least a 2.5 GPA in all undergraduate work or at least a 3.0 GPA in the last 30 semester hours. 5. Official graduate admission exam results (GMAT [500 or above], GRE [1050 or above in verbal and quantitative], or 294 or above on the revised GRE [verbal and quantitative], must be on file (except for applicants with a previous master s or higher degree; see #2 above). 6. A letter of recommendation is required with all applications for the MBAi program. The individual s potential for success in the MBAi program, his/her professional, managerial or administrative experience, as well as his/her written and oral communication skills must be addressed. Conditional Admission Students with a score of on the GMAT or on the GRE (verbal and quantitative)/ on the revised GRE (verbal and quantitative), and the overall 2.5 grade point average/3.0 GPA on the last 30 semester hours may be conditionally admitted to the MBAi program. After the student completes 9 semester hours of 6000 level graduate courses with a B (3.0) grade point average, the student will be granted unconditional admission. After completing three graduate MBAi courses, students not obtaining unconditional admission status will be dropped from the program for one calendar year, after which time the student must petition for readmission. A letter of recommendation is required with all applications for readmission to the MBAi program. The letter should address the individual s potential for success in the MBAi program as well as his/her written and oral communication skills. No Admission Students with an overall GPA of less than 2.5/3.0 on the last 30 semester hours or a score of less than 400 on the GMAT or a score of less than 930 on the GRE (verbal and quantitative) or a score of less than 274 on the revised GRE (verbal and quantitative) will not be eligible for admission into the MBAi program. Temporary Admission Students will not be allowed to register for any 6000 level MBAi course until temporary admission is cleared. The student will be allowed to take only the undergraduate pre-requisite business courses listed above. Bridge Program Students entering without a business degree and not successfully completing the ETS Business (undergraduate) exam with an overall score of 149, if the scores for any of the individual business sub-areas are at or above the national average for that subarea, the undergraduate business course for that sub-area will be waived; the student will be required to complete the undergraduate business course(s) if the sub-area score is below the current national average and must earn a grade of C or better in each course. Upon doing so, and with the approval of the Dean, SCOB or the Director of Graduate Business Programs, the student will be allowed to enter the MBAi program and register for 6000 level MBAi classes. 7 51 EXECUTIVE MASTER OF BUSINESS ADMINISTRATION (EMBA) The purpose of the Executive Master of Business Administration program is to provide an advanced level of general business education to graduates of baccalaureate programs who meet a stipulated professional experience prerequisite. This opportunity enables these students to be successful in management positions in both the private and public sectors. The program is organized to support specific and general needs of professionally diverse groups of students by providing advanced study in business administration to students who have acquired a common body of knowledge through education and professional experience. Minor modifications in curriculum allow the EMBA program to meet specific corporate or other organizational needs in contractual programs. As a result of successfully completing the EMBA program, graduates should be able to apply problem-solving skills to the strategic planning process in organizations. Accreditation The Troy University EMBA degree is accredited by the Accreditation Council for Business Schools and Programs (ACBSP). Admission Requirements Unconditional Admission 1. 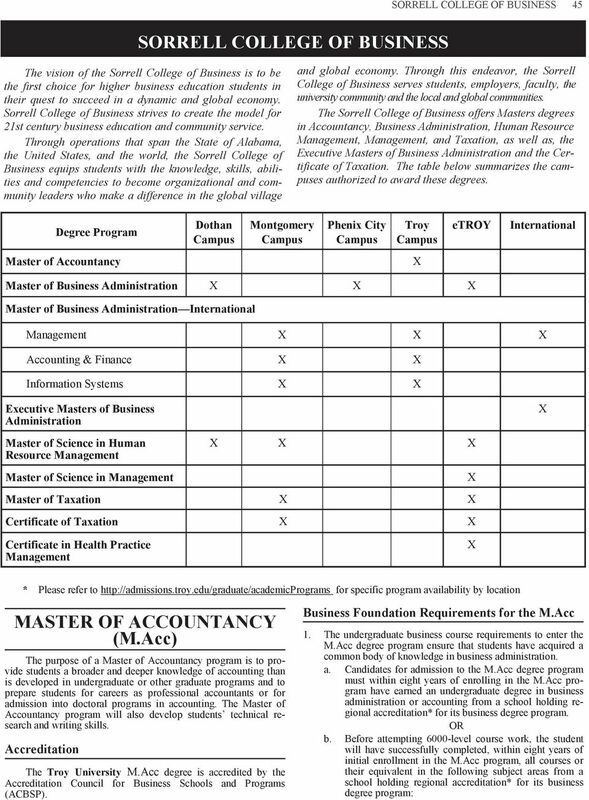 For concentrations other than those listed in (a) and (b) below, a minimum of five years professional, postbaccalaureate experience (unless modified in a contractual corporate program); or a minimum of five years managerial experience beyond first line supervision, and a. for the Accounting concentration, a baccalaureate degree in Accounting or successful completion of all Accounting course prerequisites; and b. for the Healthcare concentration, a baccalaureate degree in healthcare-related field and five years of healthcarerelated professional work. 2. Students applying for admission must provide official transcripts from all universities attended. 3. Applicants who have completed a master s or higher degree from a regionally accredited university may be admitted unconditionally. (No graduate admission test scores are required.) Official transcripts from all universities attended must be submitted, to include an official transcript showing completion of a master s or higher degree. 4. A bachelor s degree from a regionally accredited college or university is required. (Students with a baccalaureate degree from an unaccredited or otherwise accredited institution should see Unaccredited or Otherwise Accredited Student Admissions.) 5. Applicants must have achieved at least 2.5 GPA in all undergraduate work or at least 3.0 GPA in the last 30 semester hours. 6. Official graduate admission exam results (GMAT [500 or above], GRE [294 or above on verbal and quantitative]), must be on file (except for applicants with a previous master s or higher degree; see #2 above). 7. A letter of recommendation using the online Professional Reference form is required with all applications for the EM- BA program. The letter must address the individual s potential for success in the EMBA program as well as his/her written and oral communication skills. Conditional Admission Students not satisfying at least a score of 500 on the GMAT or at least a 294 on the GRE (verbal and quantitative) and the grade point average requirements for unconditional admission may be conditionally admitted to the program. After the student completes the first three graduate (6000 level) courses with a B or better average, the student will be granted unconditional admission. Students not satisfying conditional admission requirements will be dropped from the university for one calendar year, after which time the student must petition for readmission. A letter of recommendation is required with all applications for the EMBA program. The individual s potential for success in the EMBA program as well as his/her written and oral communication skills should be addressed. For the Accounting concentration, students with a B.S. degree in a field other than accounting must have completed the following courses or their equivalent. The prerequisite Accounting courses must be based on accounting standards, auditing standards, and tax laws that are prevalent in the United States. 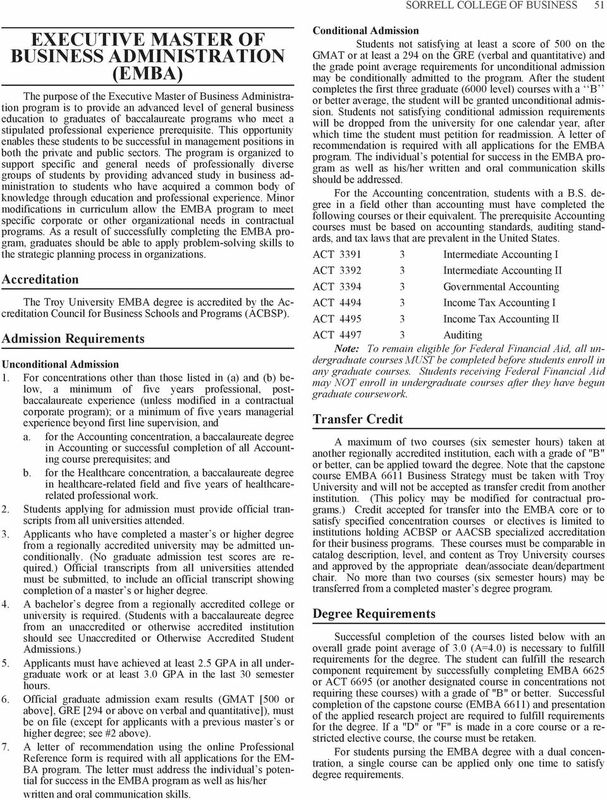 ACT Intermediate Accounting I ACT Intermediate Accounting II ACT Governmental Accounting ACT Income Tax Accounting I ACT Income Tax Accounting II ACT Auditing Note: To remain eligible for Federal Financial Aid, all undergraduate courses MUST be completed before students enroll in any graduate courses. Students receiving Federal Financial Aid may NOT enroll in undergraduate courses after they have begun graduate coursework. Transfer Credit A maximum of two courses (six semester hours) taken at another regionally accredited institution, each with a grade of "B" or better, can be applied toward the degree. Note that the capstone course EMBA 6611 Business Strategy must be taken with Troy University and will not be accepted as transfer credit from another institution. (This policy may be modified for contractual programs.) Credit accepted for transfer into the EMBA core or to satisfy specified concentration courses or electives is limited to institutions holding ACBSP or AACSB specialized accreditation for their business programs. These courses must be comparable in catalog description, level, and content as Troy University courses and approved by the appropriate dean/associate dean/department chair. No more than two courses (six semester hours) may be transferred from a completed master s degree program. Degree Requirements Successful completion of the courses listed below with an overall grade point average of 3.0 (A=4.0) is necessary to fulfill requirements for the degree. The student can fulfill the research component requirement by successfully completing EMBA 6625 or ACT 6695 (or another designated course in concentrations not requiring these courses) with a grade of "B" or better. Successful completion of the capstone course (EMBA 6611) and presentation of the applied research project are required to fulfill requirements for the degree. If a "D" or "F" is made in a core course or a restricted elective course, the course must be retaken. For students pursing the EMBA degree with a dual concentration, a single course can be applied only one time to satisfy degree requirements. 10 54 Elective Courses: (3 sh) (Select One) HRM Labor Law HRM Seminar in Human Resource Administration HRM Specialized Study in the Area of Human Resource Management HRM International Human Resource Management HRM HRM Internship IS Management Information Systems MGT Ethics in Business MGT Theory of Organizations MGT Leadership and Motivation FIN Managerial Finance There are no cross-listings with other Troy University graduate degree programs for the MSHRM. Professional military education courses are not accepted for credit in the MSHRM program. 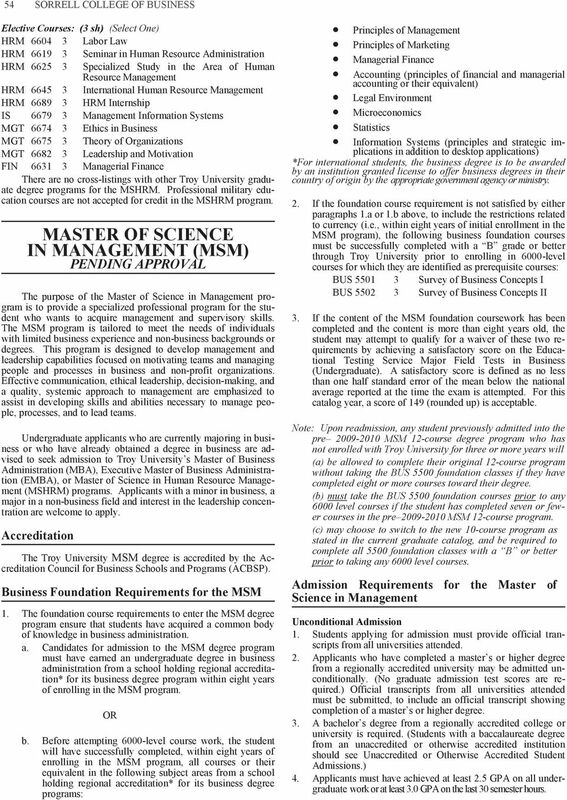 MASTER OF SCIENCE IN MANAGEMENT (MSM) PENDING APPROVAL The purpose of the Master of Science in Management program is to provide a specialized professional program for the student who wants to acquire management and supervisory skills. The MSM program is tailored to meet the needs of individuals with limited business experience and non-business backgrounds or degrees. This program is designed to develop management and leadership capabilities focused on motivating teams and managing people and processes in business and non-profit organizations. Effective communication, ethical leadership, decision-making, and a quality, systemic approach to management are emphasized to assist in developing skills and abilities necessary to manage people, processes, and to lead teams. Undergraduate applicants who are currently majoring in business or who have already obtained a degree in business are advised to seek admission to Troy University s Master of Business Administration (MBA), Executive Master of Business Administration (EMBA), or Master of Science in Human Resource Management (MSHRM) programs. Applicants with a minor in business, a major in a non-business field and interest in the leadership concentration are welcome to apply. Accreditation The Troy University MSM degree is accredited by the Accreditation Council for Business Schools and Programs (ACBSP). Business Foundation Requirements for the MSM 1. The foundation course requirements to enter the MSM degree program ensure that students have acquired a common body of knowledge in business administration. a. Candidates for admission to the MSM degree program must have earned an undergraduate degree in business administration from a school holding regional accreditation* for its business degree program within eight years of enrolling in the MSM program. OR b. Before attempting 6000-level course work, the student will have successfully completed, within eight years of enrolling in the MSM program, all courses or their equivalent in the following subject areas from a school holding regional accreditation* for its business degree programs: Principles of Management Principles of Marketing Managerial Finance Accounting (principles of financial and managerial accounting or their equivalent) Legal Environment Microeconomics Statistics Information Systems (principles and strategic implications in addition to desktop applications) *For international students, the business degree is to be awarded by an institution granted license to offer business degrees in their country of origin by the appropriate government agency or ministry. 2. 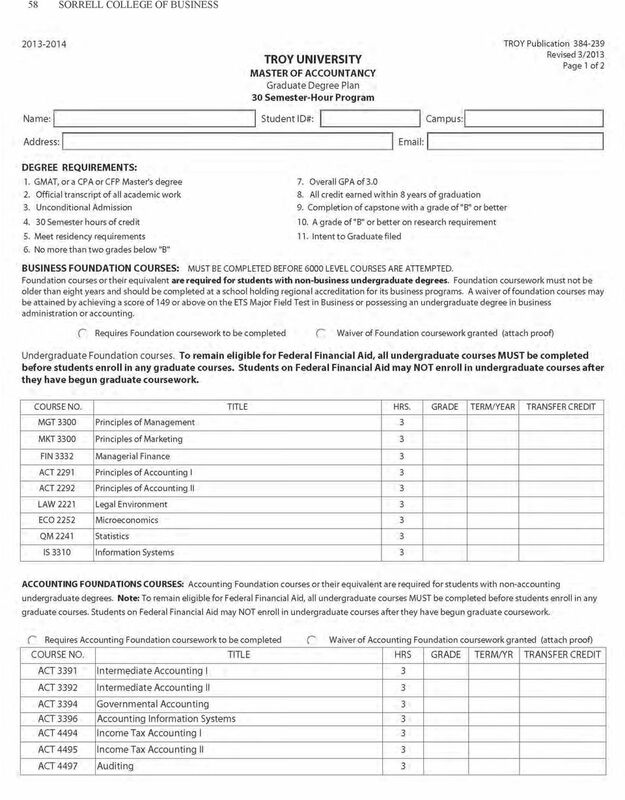 If the foundation course requirement is not satisfied by either paragraphs 1.a or 1.b above, to include the restrictions related to currency (i.e., within eight years of initial enrollment in the MSM program), the following business foundation courses must be successfully completed with a B grade or better through Troy University prior to enrolling in 6000-level courses for which they are identified as prerequisite courses: BUS Survey of Business Concepts I BUS Survey of Business Concepts II 3. 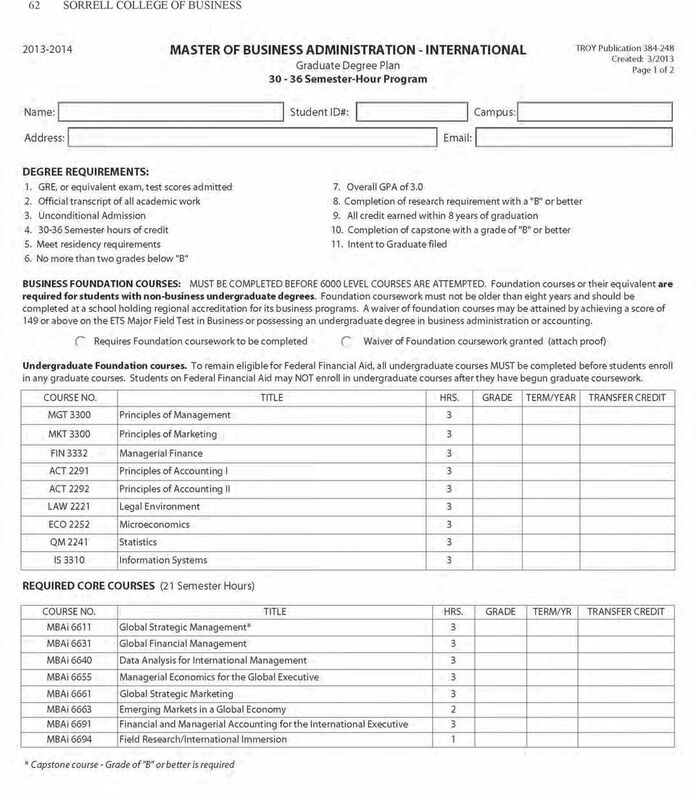 If the content of the MSM foundation coursework has been completed and the content is more than eight years old, the student may attempt to qualify for a waiver of these two requirements by achieving a satisfactory score on the Educational Testing Service Major Field Tests in Business (Undergraduate). A satisfactory score is defined as no less than one half standard error of the mean below the national average reported at the time the exam is attempted. For this catalog year, a score of 149 (rounded up) is acceptable. Note: Upon readmission, any student previously admitted into the pre MSM 12-course degree program who has not enrolled with Troy University for three or more years will (a) be allowed to complete their original 12-course program without taking the BUS 5500 foundation classes if they have completed eight or more courses toward their degree. (b) must take the BUS 5500 foundation courses prior to any 6000 level courses if the student has completed seven or fewer courses in the pre MSM 12-course program. (c) may choose to switch to the new 10-course program as stated in the current graduate catalog, and be required to complete all 5500 foundation classes with a B or better prior to taking any 6000 level courses. 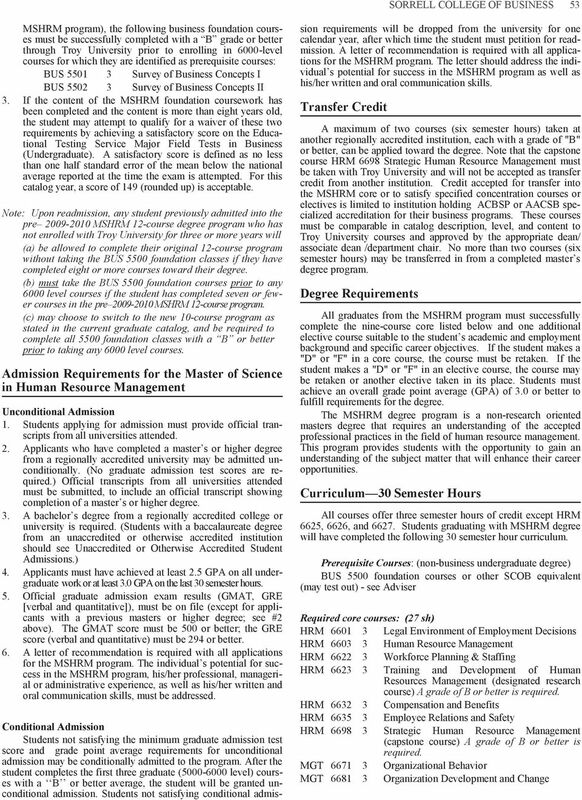 Admission Requirements for the Master of Science in Management Unconditional Admission 1. Students applying for admission must provide official transcripts from all universities attended. 2. Applicants who have completed a master s or higher degree from a regionally accredited university may be admitted unconditionally. (No graduate admission test scores are required.) Official transcripts from all universities attended must be submitted, to include an official transcript showing completion of a master s or higher degree. 3. A bachelor s degree from a regionally accredited college or university is required. (Students with a baccalaureate degree from an unaccredited or otherwise accredited institution should see Unaccredited or Otherwise Accredited Student Admissions.) 4. Applicants must have achieved at least 2.5 GPA on all undergraduate work or at least 3.0 GPA on the last 30 semester hours. 11 55 5. Official graduate admission exam results (GMAT, GRE [verbal and quantitative]), must be on file (except for applicants with a previous masters or higher degree; see #2 above). The GMAT score must be 500 or better; the GRE score (verbal and quantitative) must be 294 or better. 6. A letter of recommendation is required with all applications for the MSM program. The individual s potential for success in the MSM program, his/her professional, managerial or administrative experience, as well as his/her written and oral communication skills must be addressed. Conditional Admission Students not satisfying the minimum graduate admission test score and grade point average requirements for unconditional admission may be conditionally admitted to the program. After the student completes the first three graduate ( level) courses with a B or better average, the student will be granted unconditional admission. Students not satisfying conditional admission requirements will be dropped from the university for one calendar year, after which time the student must petition for readmission. A letter of recommendation is required with all applications for the MSM program. The letter should address the individual s potential for success in the MSM program as well as his/her written and oral communication skills. Transfer Credit A maximum of two courses (six semester hours) taken at another regionally accredited institution, each with a grade of "B" or better, can be applied toward the degree. Note that the capstone course MSM 6650 Leadership Role in Strategic Management must be taken with Troy University and will not be accepted as transfer credit from another institution. Credit accepted for transfer into the MSM core or to satisfy specified concentration courses or electives is limited to institution holding ACBSP or AACSB specialized accreditation for their business programs. These courses must be comparable in catalog description, level, and content to Troy University courses and approved by the appropriate dean/ associate dean /department chair. No more than two courses (six semester hours) may be transferred in from a completed master s degree program. Professional military education courses are not accepted for credit in the MSM program. Degree Requirements Students graduating with the MSM degree will have successfully completed the following ten course curriculum. Thirty (30) semester hours is required. Students may be required to take additional testing from non-troy organizations as part of their program. Students must achieve an overall grade point average of 3.0 (A=4.0) with no more than two grades of C to fulfill requirements for the degree. Curriculum 30 Semester Hours The 30 semester hour MSM degree offers one concentration: Leadership. This includes three core courses and seven leadership concentration ones. 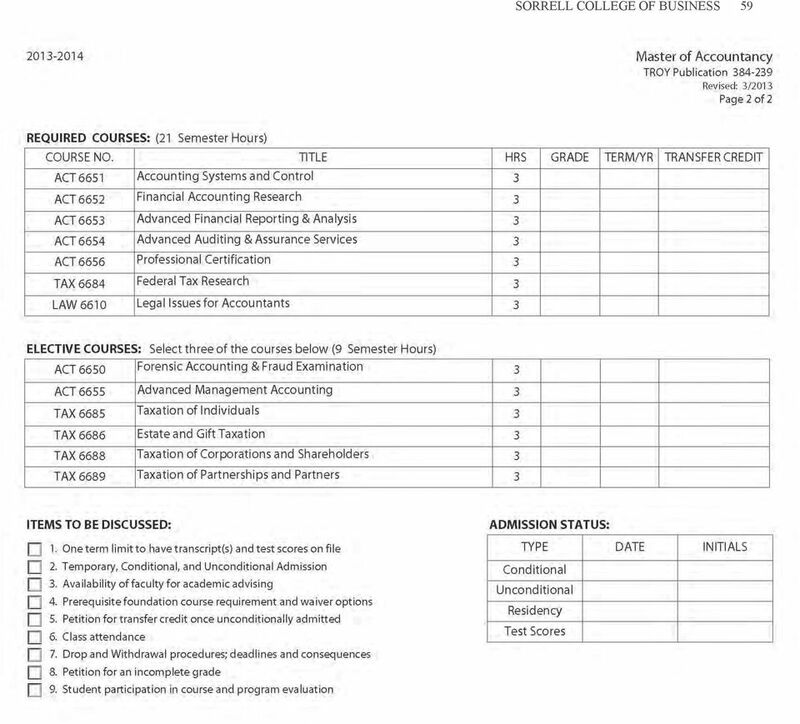 Required Core Courses: (9 sh) MSM Business Theories and Concepts (taken during first term) A grade of B or better is required. MSM Theories of Organizational Behavior (designated research course) A grade of B or better is required. MSM Leadership Role in Strategic Management (taken during the last term, assessment exams must be completed) A grade of B or better is required. 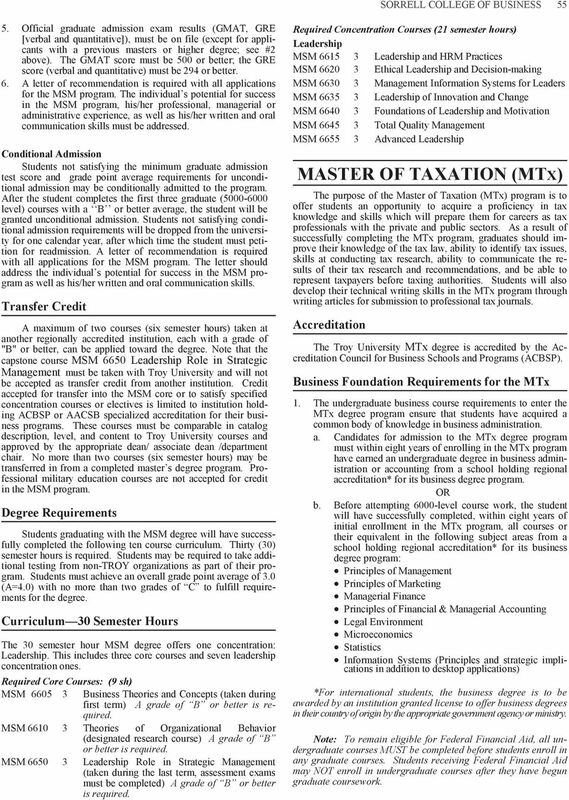 Required Concentration Courses (21 semester hours) Leadership MSM Leadership and HRM Practices MSM Ethical Leadership and Decision-making MSM Management Information Systems for Leaders MSM Leadership of Innovation and Change MSM Foundations of Leadership and Motivation MSM Total Quality Management MSM Advanced Leadership MASTER OF TAXATION (MTX) The purpose of the Master of Taxation (MTx) program is to offer students an opportunity to acquire a proficiency in tax knowledge and skills which will prepare them for careers as tax professionals with the private and public sectors. 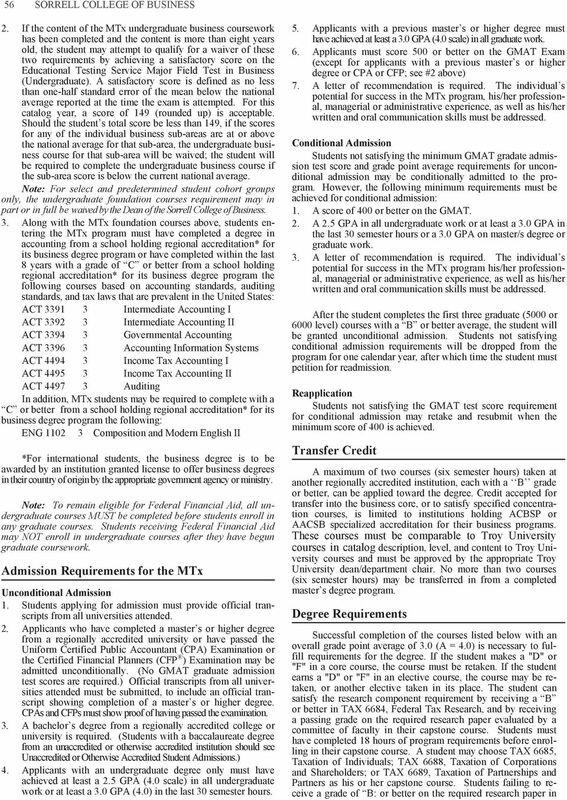 As a result of successfully completing the MTx program, graduates should improve their knowledge of the tax law, ability to identify tax issues, skills at conducting tax research, ability to communicate the results of their tax research and recommendations, and be able to represent taxpayers before taxing authorities. Students will also develop their technical writing skills in the MTx program through writing articles for submission to professional tax journals. Accreditation The Troy University MTx degree is accredited by the Accreditation Council for Business Schools and Programs (ACBSP). Business Foundation Requirements for the MTx 1. 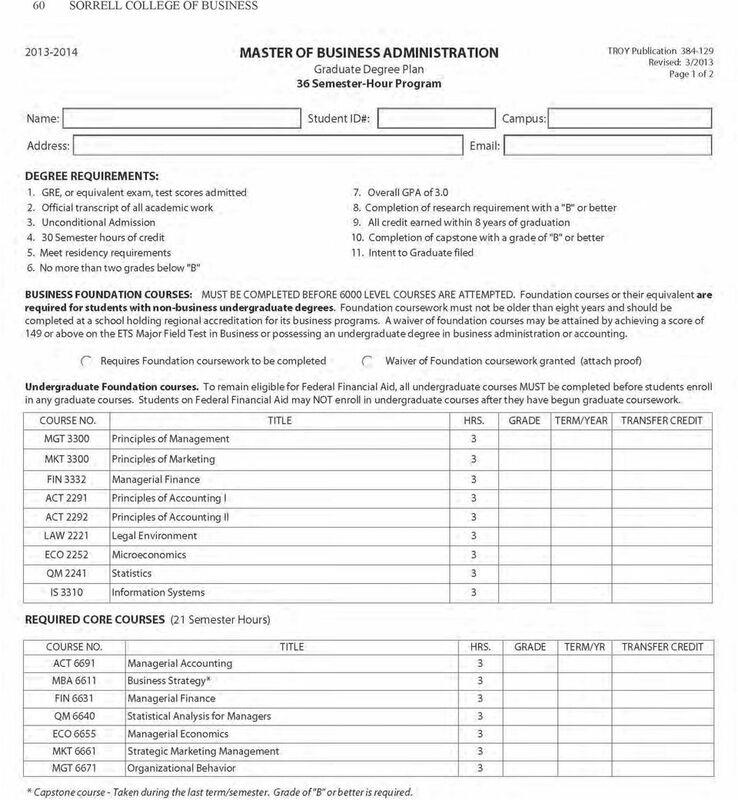 The undergraduate business course requirements to enter the MTx degree program ensure that students have acquired a common body of knowledge in business administration. a. Candidates for admission to the MTx degree program must within eight years of enrolling in the MTx program have earned an undergraduate degree in business administration or accounting from a school holding regional accreditation* for its business degree program. OR b. Before attempting 6000-level course work, the student will have successfully completed, within eight years of initial enrollment in the MTx program, all courses or their equivalent in the following subject areas from a school holding regional accreditation* for its business degree program: Principles of Management Principles of Marketing Managerial Finance Principles of Financial & Managerial Accounting Legal Environment Microeconomics Statistics Information Systems (Principles and strategic implications in addition to desktop applications) *For international students, the business degree is to be awarded by an institution granted license to offer business degrees in their country of origin by the appropriate government agency or ministry. Note: To remain eligible for Federal Financial Aid, all undergraduate courses MUST be completed before students enroll in any graduate courses. Students receiving Federal Financial Aid may NOT enroll in undergraduate courses after they have begun graduate coursework. UNO Graduate Program Requirements 2007-2008 Table of Contents MASTER S & EDUCATION SPECIALIST PROGRAMS Accounting. 1 Biology... 5 Business Administration 7 Executive Master of Business Administration..